Kick off your visit on the 15th (Wed): stroll around Retiro Park, then examine the collection at Prado National Museum, and then admire the masterpieces at Museo Nacional Centro de Arte Reina Sofia. Here are some ideas for day two: admire the landmark architecture of Plaza Mayor, then admire the striking features of Royal Palace of Madrid, and then see the interesting displays at Museo Nacional Thyssen-Bornemisza. For photos, where to stay, and more tourist information, read Madrid tour builder . Use the Route module to find travel options from your starting location to Madrid. In May, plan for daily highs up to 28°C, and evening lows to 13°C. Cap off your sightseeing on the 16th (Thu) early enough to catch the train to Seville. 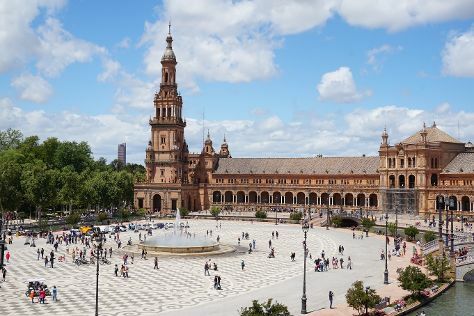 On the 17th (Fri), admire the natural beauty at Royal Alcázar of Seville, snap pictures at Puente de Isabel II (Puente de Triana), then steep yourself in history at Real Fabrica De Tabacos, and finally contemplate the long history of Plaza de España. Find out how to plan Seville trip without stress by asking Inspirock to help create an itinerary. Traveling by train from Madrid to Seville takes 3 hours. Alternatively, you can fly; or drive. Plan for somewhat warmer nights when traveling from Madrid in May since evenings lows in Seville dip to 17°C. Finish up your sightseeing early on the 18th (Sat) so you can travel to Barcelona. On the 18th (Sat), don't miss a visit to Placa Espanya, then appreciate the history behind Casa Batllo, then walk around Parc Guell, and finally admire the landmark architecture of Basilica of the Sagrada Familia. Get ready for a full day of sightseeing on the 19th (Sun): stroll around Ciutadella Park, take a stroll through El Barri Gòtic, and then indulge your taste buds at Food & Drink. To find photos, ratings, other places to visit, and other tourist information, you can read our Barcelona travel itinerary planner . You can fly from Seville to Barcelona in 3.5 hours. Other options are to take a train; or drive. While traveling from Seville, expect a bit cooler days and about the same nights in Barcelona, ranging from highs of 25°C to lows of 16°C. Finish your sightseeing early on the 19th (Sun) to allow enough time to take a train back home.